There is not cost for this service. The Recycling Program is run by EPIC/SMILE of St-Malo Inc.
:#2 – Milk jugs, ice cream pails, margarine, yogurt, pill, shampoo, liquid laundry detergent containers, etc. PLEASE KEEP RECYCLING BAGS AT A MAXIMUM WEIGHT OF 10 KG (20 LBS). All Styrofoam (including egg containers), used paper plates & napkins, tissues, diapers, food scraps, plastic bags, etc. EPIC / SMILE of St. Malo Depot at 120 St. Malo Street, St. Malo, MB. 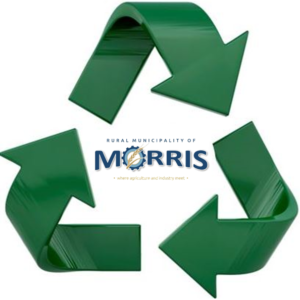 Morris Home Hardware now accepts light bulbs and paint for recycling. Please make use of this service they are offering and stop by during business hours to drop off your old light bulbs and paint rather than throwing them away! Drop off your used oil containers at the Town Public Works yard (459 Boyne W) at any time of the year and receive a free replacement container of oil! (While supplies last). Please contact the Town of Morris Public Works at (204) 746-2532 for drop offs. Please visit the MARRC (Manitoba Association for Resource Recovery Corp.) website for more information on used oil recycling.